How should we diagnose gestational diabetes? Insulin is a hormone that helps the body’s cells to absorb glucose, to turn it into energy. During pregnancy, the mother’s resistance to insulin increases so that glucose can easily cross the placenta to help the baby grow and develop. If mother’s insulin resistance becomes too great diabetes can develop. Diabetes that develops during pregnancy is known as gestational diabetes (GDM). Certain things increase the chance of a woman developing GDM; these include being from an ethnic background where there is a high prevalence of diabetes in the population, like in South Asia, or being overweight or obese. Gestational diabetes is diagnosed using an oral glucose tolerance test (OGTT), where mother’s blood samples are taken twice after they have fasted overnight. The first blood sample is taken before a sugary drink and the second one two hours after the sugary drink. This is to measure blood sugar levels to see how well the mother’s body copes with sugar. Women with blood sugar levels that are higher than a certain threshold have gestational diabetes and are more likely to give birth to a larger baby with higher levels of fat. Being larger and fatter at birth can cause problems and may increase the chance of infant diabetes and obesity later in life. It’s very important that we know whether all women taking the glucose tolerance test should be judged using the same sugar level thresholds or if these should be different for women of south Asian and white British origin. This question is complex because we know that compared to white British women, South Asian women have a higher risk of gestational diabetes, less risk of having a large baby, but the same risk of having an infant with higher fat levels. We examined how large birthweight and infant fat levels, as well as other pregnancy complications, including Caesarean delivery, increased with each increase in mother’s blood sugar levels, (at OGTT) for South Asian and for White British women. We also calculated new blood sugar levels for diagnosing GDM at which the risk of giving birth to a large and/or an unhealthily fat baby increased by 75%. These blood sugar levels are different for South Asian than for white British women and lower than those used today. These new thresholds increase the amount of women that would be diagnosed with gestational diabetes, but would identify more infants at risk of being born large and/or unhealthily fat at birth. There are known effective treatments that reduce the risk of complications for women with gestational diabetes around the time of birth, but little is known about whether treatments reduce the risk of future infant obesity and ill health, or whether these treatments are cost-effective. We want to investigate the cost-effectiveness and the short and longer-term health impacts of treatments given to women identified as having gestational diabetes using these lower blood sugar levels and other alternative thresholds. 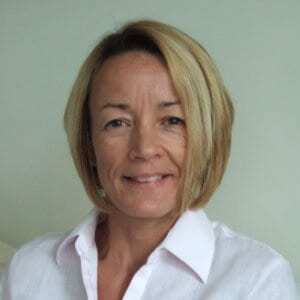 Diane Farrar is a practicing midwife and has worked for many years in the NHS, specialising in intrapartum care. She has a BSc in health science (midwifery) from the University of Leeds, a BSc in psychology from the Open University and a PhD in pharmaceutical innovation (research) from the University of Bradford and is a visiting research fellow at the University of York. Diane was chief investigator on a HTA funded project evaluating screening and diagnostic tests to identify women with gestational diabetes. She was awarded an NIHR post-doctoral fellowship in 2014 to investigate the identification and treatment of women with hypertensive disorders of pregnancy. Diane is an experienced Cochrane systematic review author and has published papers related to various pregnancy related topics including: the third stage of labour, gestational diabetes, cognition in pregnancy, maternal BMI and nutrition in pregnancy. Diane is joint lead of the reproductive health trials team at the Bradford Women’s and Newborn unit and has extensive experience in the conduct of randomised trials in pregnancy and childbirth.